Well I'm willing to donate a Phobos Cruiser to any Contest, as a recent inventory check I discovered that I've managed to get two of them. Before I ad my 2 cents worth here, let me say my biggest obstacle is time. That said, I don't really need a prize, especially if it is not of interest to me. Gonativetoys has contests. He has several action figures designed specifically for customizing, but only one in production so far. Typically the prize breakdown is 1st: 3 Alpha Blanx and 6 GI Joes, 2nd: 2 Alpha Blanx and 4 Joes, 3rd: 1 Alpha Blanx and 2 Joes. Personally I have no interest in the Joes and would be happy with just the extra Blanx figures. Which brings me to my suggestion, and I know I am going to regret this. I collect and customize action figures. This includes the vehicles and playsets. Sometimes it is a great idea that the toy company wasn't intelligent enough to come up with. Sometimes, as with the Playmates ST Bridge playset most recently, they just aren't competent enough to finish it. I have a mobile of trek vehicles, including the Workbee. I enlarged this to scale with the Mego figures and printed it out and assembled it. This was just a test, I want the next one to have a visible cockpit. So, my idea is: Take a Trek action figure and build a vehicle or playset for it. 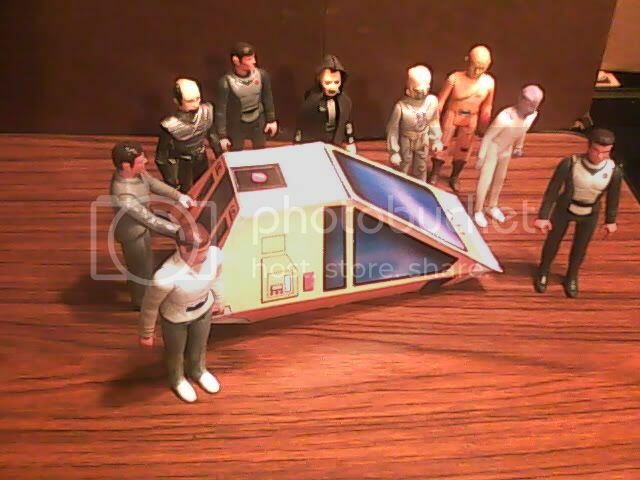 Take a Trek figure and make a vehicle or playset for it.